It happens when your child turns a year old. Mothers group friends start to spend more time in paid work and less time at coffee gatherings. People start to ask whether you are returning to work soon. Others start to presume that you have decided to forgo your career. And suddenly impermanent maternity leaves feels a whole lot more permanent that you had intended it to. My career has always been important to me. One of my anchors. It has been a part of me, integral to my identity. The way I want to see myself and the way I would like others to view me. A year after Isaac was born, I was back to work. It was busy and stressful. Our family committed itself to the hamster wheel of waking, child-care, working, sleeping. My work was interesting and fulfilling but the lifestyle did not feel sustainable. In fact, I kept waiting for the balls I was juggling to drop. Invariably, the one that did related to my own self-care. For the first time in my life I felt that what I was sacrificing for my career was too much. Not only was it too much, no-one seemed to be acknowledging the sacrifice. After asking myself some hard questions, I stepped down from a senior position and negotiated a two day a week role that did not involve managing people. Did I go backwards in my career? No doubt. Was it the right decision for my family? Yes. Was I incredibly lucky to work for a company that values family life, its employees and was open to this idea? A resounding and grateful yes. It was while working within this role that I said hello and goodbye to Xavier. I returned to work a few months later. That return was not spurred by a desire to advance my career. There were a myriad of other reasons. I was grasping for anything that made sense and gave me structure. My world had blown apart, and I was picking up the tattered pieces, trying to put them together again. But they did not easily slot back into the places they once did. Priorities had shifted. Perspective had changed. Work gave me a place to go. Things to do. A place where my frayed self-confidence could repair itself. But I did not think of work in the context of purpose or identity. My life was on auto-pilot and I was in survival mode. As Elijah turned one and I did not return to work, I felt a loss of identity. I am due to return in January, giving me another six months with my precious boy. I have started to take the reins of my life again. I am no longer in auto-pilot mode but those priorities have still shifted. Yet, the prospect of not going back to work has left me at sea without an anchor I once relied on. I think that anchor is probably more about purpose than career. And I have yet to figure out what that purpose is. Whilst I am sure that my career will still be a large part of it, I need to understand it within the context of a different perspective. One of the things that I do love about my workplace is their dedication to personal development. It is not some thing we often do outside of the structure of work or education. But I knew I had to get down on paper what was scrambled in my head. 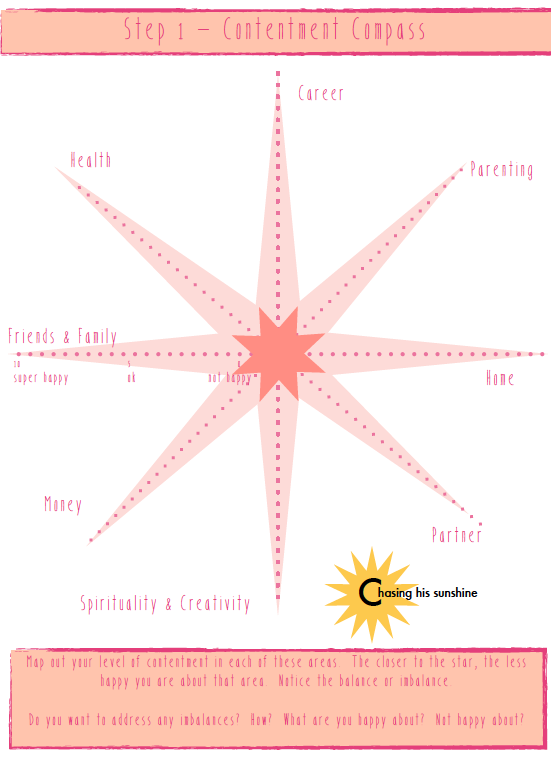 To that end, I created a series of steps to assess my life as it is, centred around the things that are most important to me. I have decided to share those worksheets in the hopes that they may help others who are feeling a little lost within their own lives. If you do decide to use these worksheets, give yourself some time and space to focus just on yourself. I hope that you find them useful.